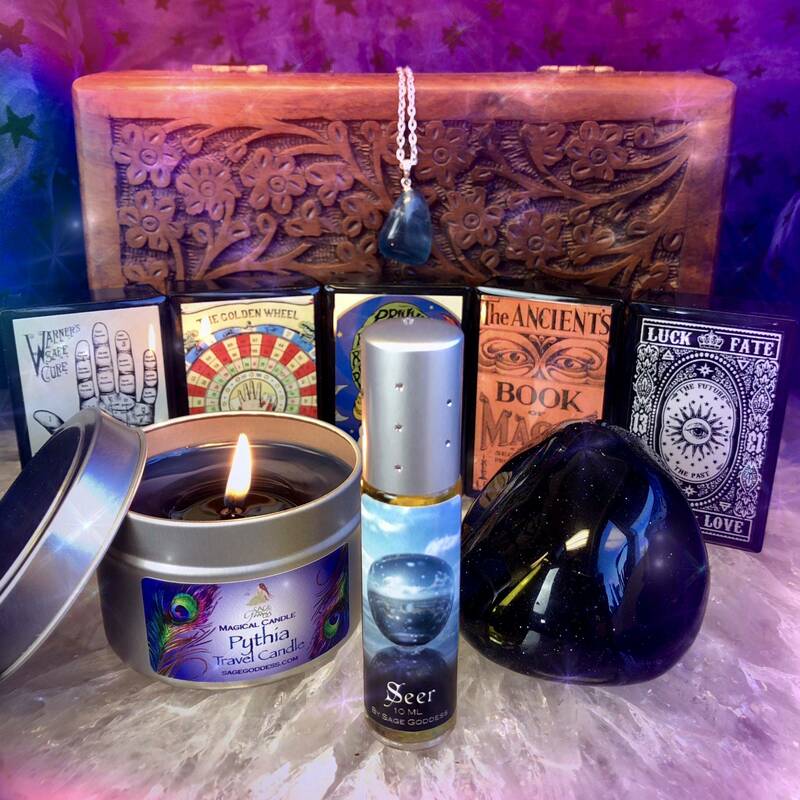 Get ready to unlock your innermost psychic gifts with this Psychic Development Box! 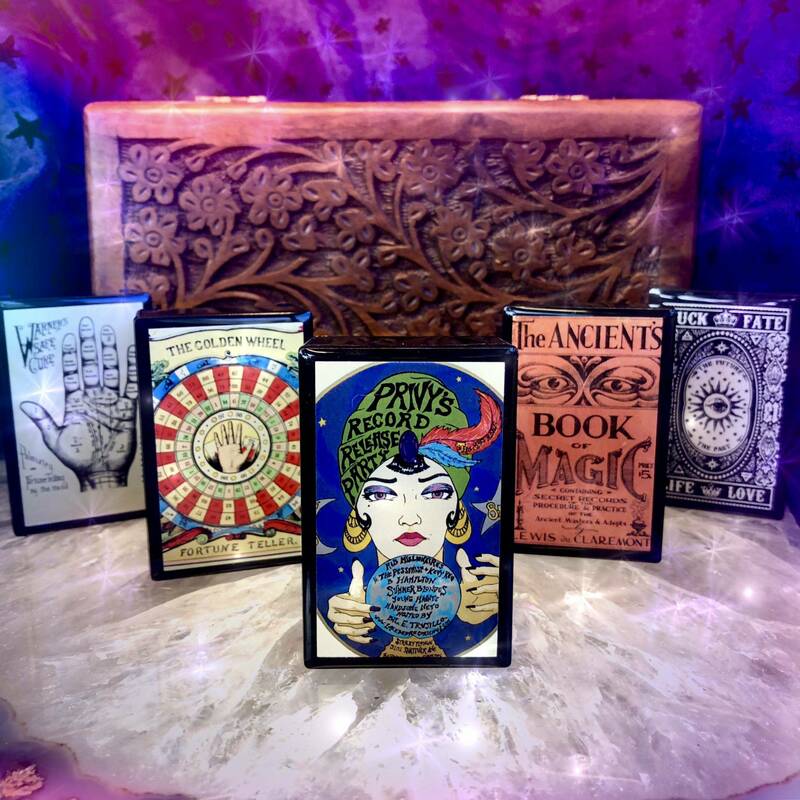 We’re all born with intuition and innate psychic abilities, and this box will help you tap into and strengthen yours. Each box comes filled with magical treasures, designed to open your Third Eye Chakra – the center through which divine wisdom flows through. 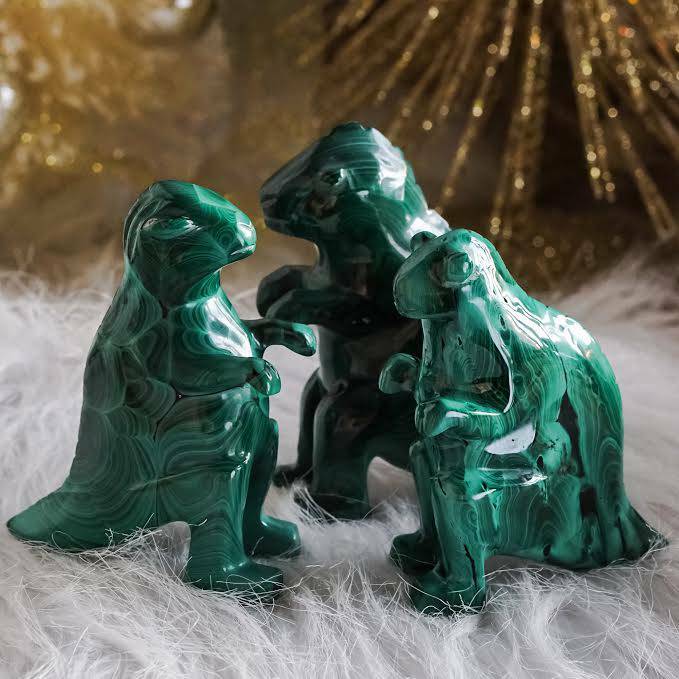 This chakra can easily become clouded with the energetic debris we pick up from the world around us, but this offering will help you dispel of these stagnant energies. Work with these tools to bring clarity to your spiritual vision, so that you may become an open channel for the messages of Spirit. One (1) 10 ml bottle of Seer Perfume. Seer Perfume is a powerful divination blend, and its fragrance is deep, wise, and knowing. This blend is laced with notes of cypress and ylang ylang, and was crafted to help you find clarity and wisdom. 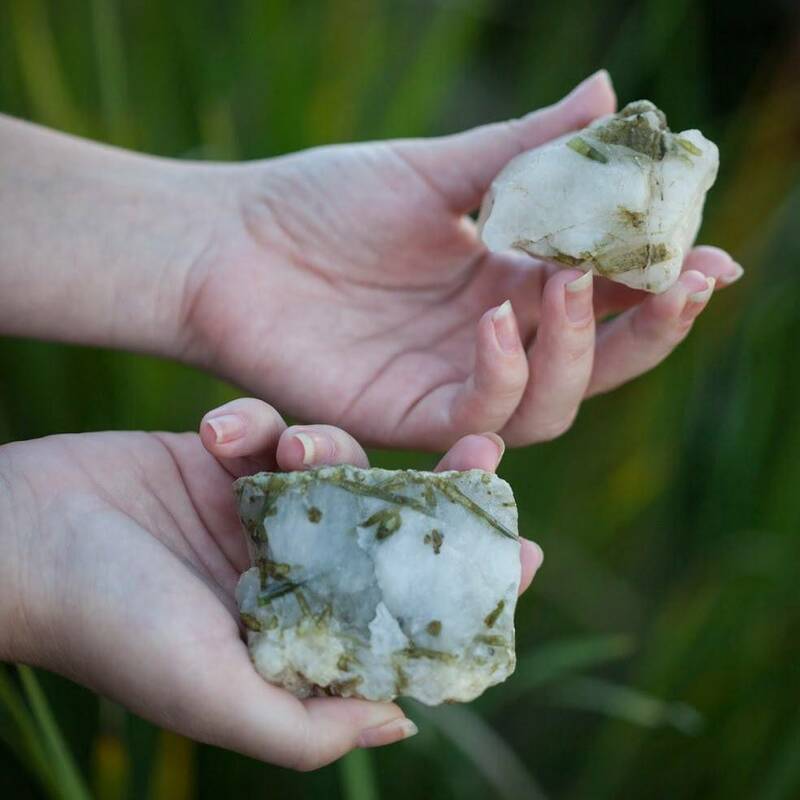 Each bottle has been infused with a clear quartz chip stone, for amplified psychic energies. 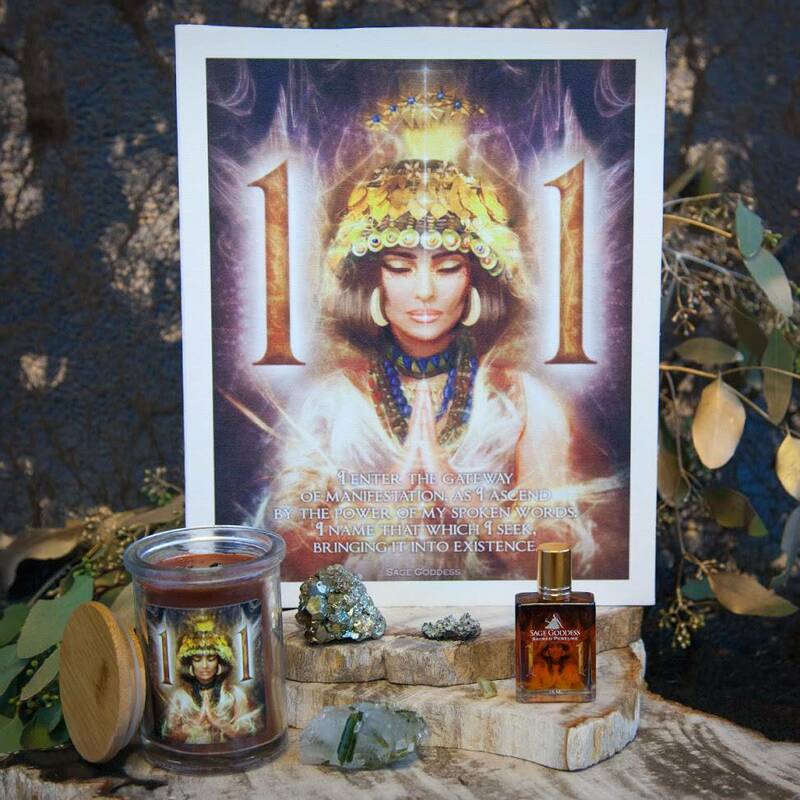 One (1) 2 oz travel candle blended with Pythia Oil. This candle was hand-poured right here at SG Headquarters, with deep blue soy wax and Pythia Oil. Pythia was the first oracle spirit who pronounced her visions from her pedestal within Delphi. 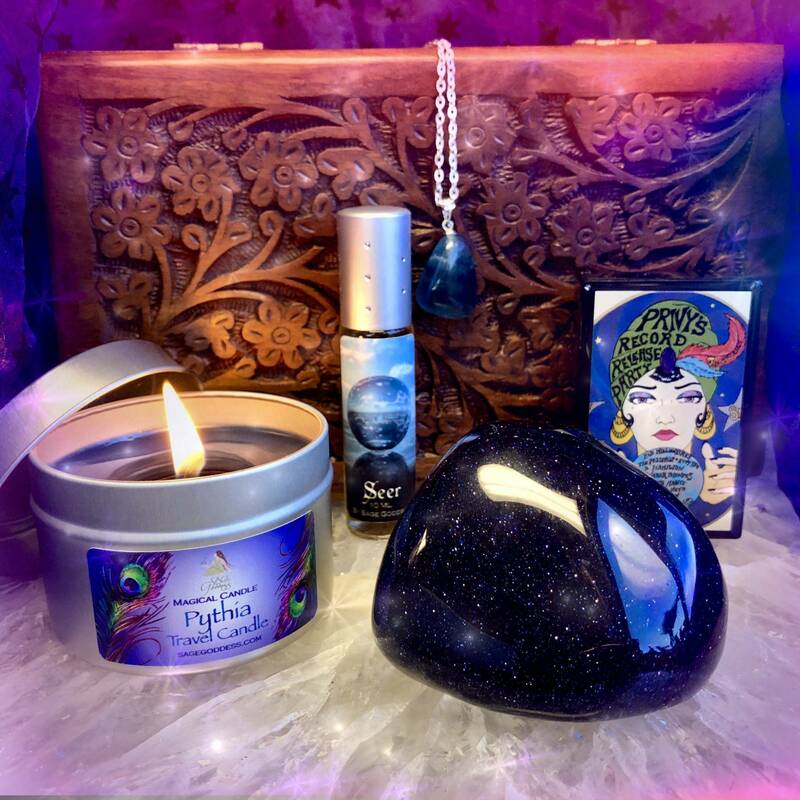 If you seek to develop your psychic abilities, Pythia is your oil. Blended with cypress and Damask rose, it envelops your senses in ancient scents we know were used in the Oracle back when Pythia would have been intuiting her messages. To add to the magic, each candle has been topped with clear quartz. One (1) set of matches in an enchanting box. Use these matches to light your travel candle and invoke the powerful element of Fire. One (1) blue goldstone powerstone. Blue goldstone brings dreams to reality and reveals the things unseen. 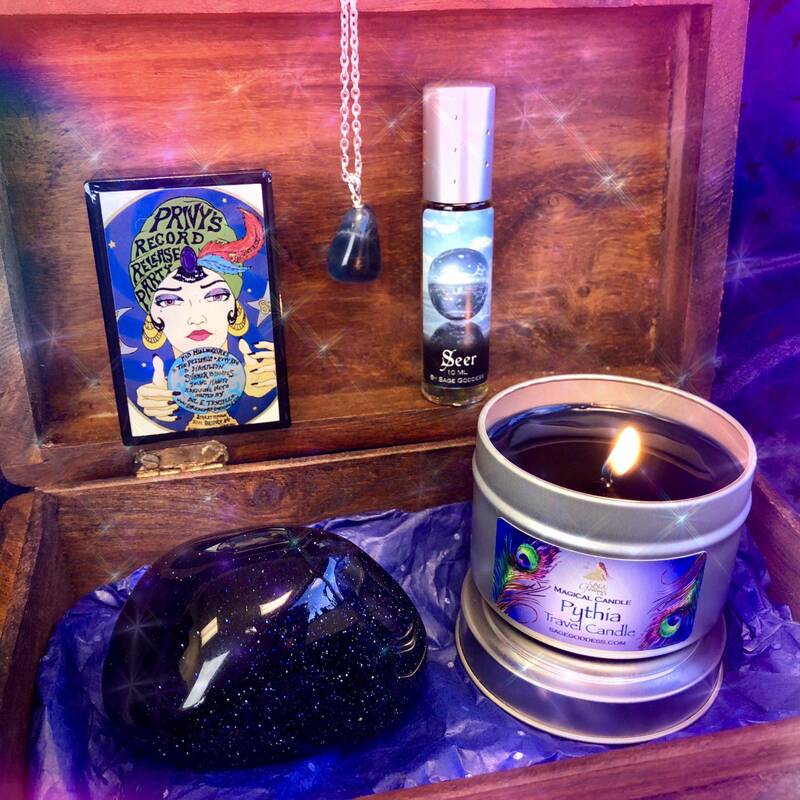 Its deep indigo coloring takes you deep into the Third Eye chamber and connects you with divine wisdom, energy, and courage. One (1) teal fluorite Intuition Pendant. This gorgeous pendant will facilitate clear vision – both literally and spiritually. Adorn yourself with this pendant to gain emotional clarity and to become a clear channel for spiritual wisdom to flow through. Note: Please always burn candles on a heatproof stable surface, and never leave a burning candle unattended. The perfumes and oils in this set are made with natural essential and carrier oils, and may contain fragrance oils. Cap color, chip stone, and color may vary slightly. For external use only. This listing is for one (1) Psychic Development Box, as described above. Yours will arrive lovingly parceled along with a single leaf of white sage and cards describing the properties of the stones. The entire box is magical! I’ve been learning how to read tarot cards and I use the candle, Seer, the stone and the necklace. Layering everything helps to bring the Universe to me and me to the Source to get a more intuitive reading of the cards.